The King of Maharashtrian spices, this masala is an essential ingredient of Maharashtrian cuisine and is used in the preparation of day to day dishes like dal, sabzi etc. In order to suit the various and precise requirements of our esteemed clients, our enterprise is dedicatedly betrothed in providing Goda Masala in the market. 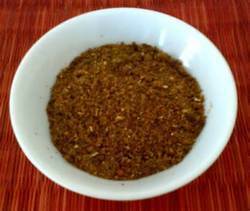 Our company has gained immense experience in the field of presenting Goda Masala.